What’s even better than an adorable pet? A pocket quiz console with dozens of cute pet puzzles – and fuzzy little heart-warmers to make you say ‘ahhhh!’ This gorgeous gadget is the last word in adorable… and it’s stuffed with smart, sweet fun to keep you busy on the move. Just scan an animal photo-card and put in the secret code to start playing one of five fab pet-themed quizzes. With over 1000 questions to puzzle over, plus gorgeous pet helpers to lend a paw, you’re in for purr-fect fun! 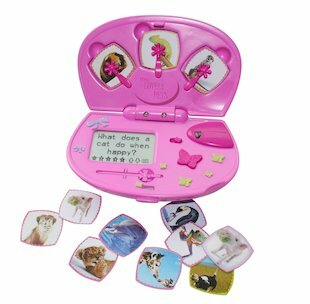 Includes: electronic console, pocket pouch, game cards, 5 quiz game modes, 20 adorable pets and over 1000 quiz questions.